Early saxifrage is one of our earliest, showy, wildflowers. A native of the gorges around Ithaca, it loves rocky cliffs and dry ledges. Its name is from the Latin words saxum, meaning "rock" and frangere, "to break" and it was thought it helped disintegrate the rocks it grew upon. The common German name for early saxifrage is "Steinbrech" or "Stonebreak"(1). Some European species were reputedly thought capable of dissolving kidney stones. Though listed as "common" in Weigand and Eames (4), and "frequent" by Wesley, et. al. (3), it may not be as plentiful as it once was. In her 1902 book "The Brook Book", Mary Rogers Miller observed "All up and down the rocky sides of the gorge, wherever a thin sheet of soil could be found to cling to, there was the saxifrage, by hundreds and almost by thousands. (2)"
Saxifraga virginiensis is in the Saxifrage (SAXIFRAGACEAE) family whose other locally common members include mitrewort and foamflower. Two others, no longer included in the same family but closely related, are grass of Parnassus and gooseberries in the PARNASSIACEAE and GROSSULARIACEAE families, respectively. Saxifraga virginiensis is four to ten inches tall with white flowers in clusters. Each star-like flower has five petals and ten yellow stamens. The single pistil has two styles. The flower stalk arises out of a rosette of somewhat fleshy leaves whose margins are coarsely toothed. The lower stem is very hairy and sticky. 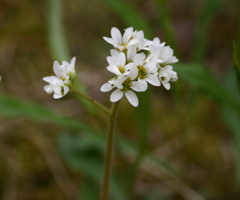 Two other Saxifraga species are listed for our area. Swamp saxifrage, S. pennsylvanica emerges a month or so later in our area and is commonly found in wet habitats (meadows, swamps, etc.). Yellow mountain saxifrage, S. aizoides, is very rare in this area. It emerges later still and prefers dripping wet, calcareous cliffs. 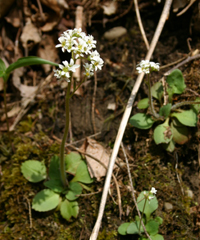 If you want to see early saxifrage in our area two good places are Upper Buttermilk Falls State Park and Lick Brook. It will be flowering by late April. Dana, Mrs. William Starr, How to Know the Wildflowers, p18-19. Dover Publications Inc, New York, 1963. First published in 1893, it has become a classic introductory wildflower book. She later published another classic How to Know the Ferns in 1907 under the name "Frances Theodora Parsons" after her first husband died and she remarried. Miller, Mary Rogers, The Brook Book, p227. Doubleday, Page & Company, New York, 1902. The author was lecturer on Nature Study at Cornell University at the time of publication. 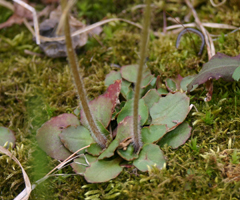 F. Robert Wesley, Sana Gardescu, and P. L. Marks, Vascular Plant Species of the Cayuga Region of New York State, 2008. Weigand, Karl M. and Eames, Arthur J, The Flora of the Cayuga Lake Basin, New York; Cornell University Agricultural Experiment Station Memoir 92, p238. Ithaca, New York, 1926.